For years I jokingly told Dan I was going to be the next Grandma Moses. I didn’t actually think it would take me this long to get back to painting. I am of course not in my seventies, and based on the photo I saw of Grandma Moses on Sunday at the San Diego Museum of Art, Arnold Newman exhibit, I don’t look anything like her either. (Thank God and good nutrition) I am however in my fifties, an age where, at least in this country, many women are written off. I feel like I am just beginning. I actually look decent for my age, but more importantly, by this point in my life I understand that it isn’t an egotistical thing to say that I am good at something. It’s simply a fact. I find that I have gained a certain amount of self-confidence, it actually sort of crept up on me. We have a friend (thank you Wayne), who said there was something about turning fifty that gave him the right to say what was on his mind. (I’m paraphrasing here.) I am feeling the same way, and I’m definitely feeling it in my work these days. Expression is coming easier, it’s almost as if the paint is flowing easier. After yesterday’s breakthrough I had a moment earlier today, a momentary panic actually, that today’s work would pale in comparison to what I had achieved with the breakthrough. And then my fifty something brain kicked in, it said loud and clear, “who cares?” This is a no regrets project, I’ve said it before, warts and all, everything gets posted. But you know what? I have the beginnings of something really nice. No it isn’t garnering my astonished “Oh My God, I did that”, response of yesterday. And that’s OK. Breakthroughs don’t happen every day, if they did they wouldn’t be so spectacular. What I do have tonight is something that I entered into with fearlessness, and that is a great thing for me and my future as the next Grandma Moses, with of course much better hair and makeup. 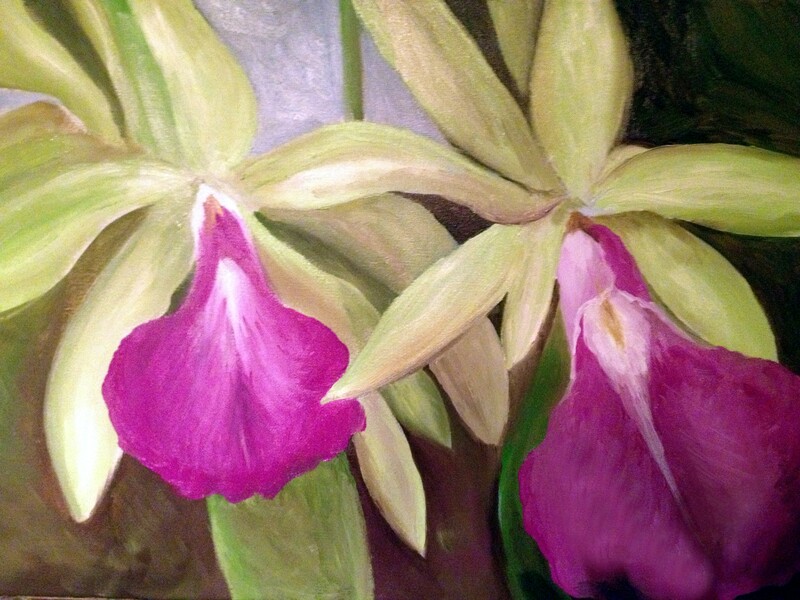 Tonight, oil on canvas, orchids from a photo I took on Sunday in San Diego. My favorite color combination, green and purple. Not exactly where I want it to be yet, drying time frustrating me yet again, before I can finish what I want, but I’ve got a good start. This entry was posted in art, Art and my life, Fine Art, Oil Painting, Uncategorized and tagged art, Fine art, Grandma Moses, humor, life, loving words, oil painting, Paint, painting, Photograph, photography, projects, self esteem, thoughts, Visual arts. Bookmark the permalink. Simply said…you are amazing! So talented in so many ways. I’m honored to know you and have you as one of my dearest friends. If only everyone knew you the way I do! Lucky me:) And you’re right… it IS just the beginning! Life is all about perspective.